So you just purchased your first iPhone? Although it seems like everyone has an iPhone these days, it's not a given that you'll instantly know how to use one. And that's where this handy book comes in. 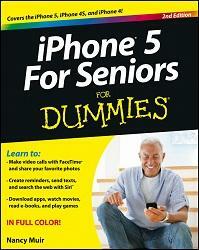 Written in the friendly For Dummies style and sporting senior-friendly larger type and full-color illustrations, this book clearly shows you how to use your iPhone, even if it's your first-ever smartphone. Make calls, send e-mail, download videos, read e-books, FaceTime video chat, and discover the wonderful world of apps. It's all here and much more!